The Seca 354 pediatric scale is a baby scale and floor scale for children -- all in one unit. Babies can be weighed safely and comfortably in the weighing tray of the seca 354. By detaching the tray from the base by pressing a button one converts the scale into a fully functional digital floor scale with a capacity of 110 lbs. The Seca 354 is a baby scale and floor scale for children in one . Weighing tray easy to detach from base . Breast-milk-intake function . Mobile and robust for easy transport. the basis of experience gained in everyday practice. This digital baby scale can be used either as a baby scale or as a floor scale for small children. The Seca 354 is not only ideal for use in baby wards, pediatricians’ surgeries and for midwifes but also for use by parents who wish to control at home the weight of a newborn. The Seca 354 pediatric scale is a baby scale and floor scale for children -- all in one unit. Babies can be weighed safely and comfortably in the weighing tray of the seca 354. 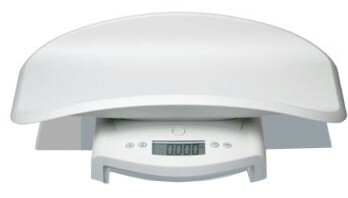 The rounded shape of the tray with its slightly raised sides makes the baby feel safe and in baby scale mode the scale has a capacity of 44 lbs. By detaching the tray from the base by pressing a button one converts the scale into a fully functional digital floor scale with a capacity of 110 lbs.